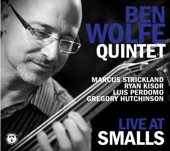 The St. Louis-based independent label MAXJAZZ has scheduled the release of bassist/composer Ben Wolfe's new CD From Here I See for Tuesday, April 2. 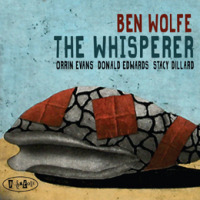 The album is Wolfe's second for MAXJAZZ, which previously released his CD No Strangers Here back in 2008. The NYC-based Wolfe is known for his work with Harry Connick Jr., Diana Krall, and the Jazz at Lincoln Center Orchestra, and also teaches at Juilliard. His new recording features him with pianist Orrin Evans, drummer Donald Edwards, and saxophonist J.D. Allen, along with a string quartet on several tracks and special guest appearances by trumpeter Wynton Marsalis, guitarist Russell Malone, and saxophonist Marcus Strickland. Audio samples of From Here I See should be online soon at Wolfe's page on the MAXJAZZ website.